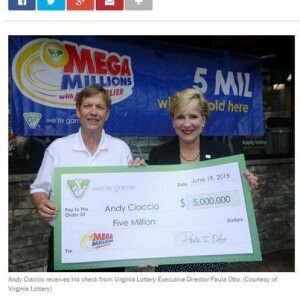 It is not clear what made Andy Ciaccio buy a lottery ticket along with his regular cup of coffee at the Sheetz gas station in Warrenton, Va. But whatever it is made him a millionaire many times over. Interestingly, Ciaccio not only bought a Mega Millions ticket, he also paid an extra dollar for the Megaplier option. After matching just five numbers in the June 12 draw, his winnings came up to $5 million. But the winner spent a week completely unaware of his good fortune; only after the lottery started announcing it was looking for a big winner from the area did he check his entry!